Cerebral localization in its practical relations. Journal : Transactions of the Congress of American Physicians and Surgeons ; vol. i. New Haven : Tuttle, Morehouse & Taylor, 1889. Description : 184-284 p. [1 l. pl.] ; ill.: 2 phot. figs., 7 engr. figs., ; 24 cm. Photograph : one leaf with two phototypes of brain specimens. Photographer : Andrew Jackson Parker (attributed by bibliographer). Subject : Brain — Cerebral localization. Author caption: Professor of Diseases of the Mind and Nervous System in the Philadelphia Polyclinic and College for Graduates in Medicine; Lecturer on Mental Diseases in the University of Pennsylvania; Neurologist to the Philadelphia Hospital. Established the nervous ward of the Philadelphia General Hospital, 1877. Founder of the Philadelphia Neurological Society, 1884. Professor of neurology, University of Pennsylvania, 1877-1915. President, American Neurological Society, 1886, 1924. Gave the first description of alcohol-related polyneuropathy with behavioral symptoms, 1886. GM 4711: symptomatology of the degeneration of the pyramidal tract, 1900. GM 4714: first description of unilateral descending paralysis, 1906. Author: The nervous system and its diseases..etc. Philadelphia: J. B. Lippincott, 1889. Photo caption: Fig. 8.—Brain of Delusional Monomaniac. Photo caption: Fig. 9.—Chinese Brain. The photograph captioned, "Delusional Monomaniac," represents the brain of James Burk who was a resident in the insanity department of the Pennsylvania Hospital until 1885 when he perished in a fire which destroyed much of the ward. 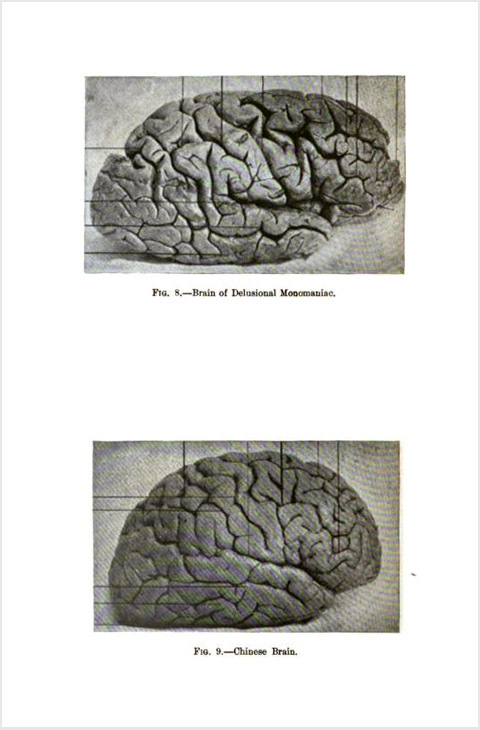 Both images were previously published in volume 13 of the Journal of nervous and mental disease, illustrating Mills's paper on the comparative morphology of the human brain. Here the photographs illustrate general remarks found in a section titled, Morphological Peculiarities of the Human Brain, where Mills calls for further study of the anomalies and peculiarities found in the external gyres of lower order brains. The entire opuscule is a tour-de-force bibliography of the nascent science of localization—an annotated panoptic review of the literature beginning with Gall and ending with Hughlings Jackson's search for "discharging lesions" in cases of epilepsy. For a scholar's first foray into nineteenth century brain science, this paper by the "dean of American neurologists" holds the pole position.